Electrically operated power circuit breakers use various accessories mounted inside the breaker for remote indication and automatic operation. Circuit breaker accessories are matched to system control voltage and may be available as factory-installed options or in field-installable kit form. Some typical control voltages include: 250VDC, 240VAC, 120VAC, 125VDC, 48VDC, 24VDC. Auxiliary Switches provide remote indication of the breaker main contact position, changing state when the minimum isolating distance between the main contacts is reached. Usually Form C contacts, NO/NC with common neutral. A Contact – Open or closed same as the breaker. B Contact – Opposite to the breaker contacts. Connected/closed switches combine "connected device" and "closed device" information, indicating "circuit is closed." The overcurrent trip switch provides remote indication that the circuit breaker has opened because of an electrical fault. Typically one set of form C contacts, NO/NC with common neutral. The switch is activated and the outputs change state whenever the breaker is tripped by an overcurrent or ground fault or protective relay function via the Trip Unit. A trip caused by the manual OPEN button or by the Shunt Trip or Undervoltage Trip Device accessory does not activate the Bell Alarm. The accessory can be reset, returning the contacts to their normal configuration, by reclosing the breaker or by manually resetting the target on the breaker escutcheon. The Bell Alarm with Lockout prevents closing of the breaker after a protection trip until the lockout is reset. 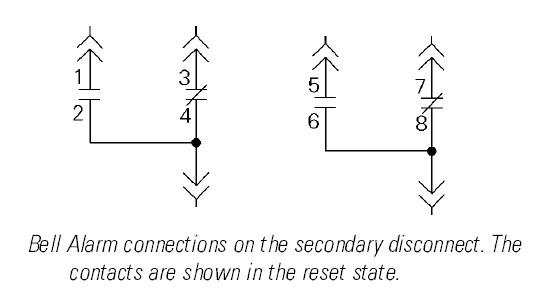 The electric reset is used to reset the circuit breaker remotely after an electrical fault. The spring-charging motor provides a means of electrically charging the closing springs automatically after the circuit breaker closes. When the springs are fully charged, a cutoff switch automatically de-energizes the motor. The closing springs will recharge automatically after the breaker closes unless an external switch contact is wired into the spring charging circuit. The spring-charged contact indicates that the circuit breaker is charged. Usually a form C contact. The shunt trip coil opens circuit breaker when energized. Shunt Close will close a circuit breaker when energized, if the device is ready to close. 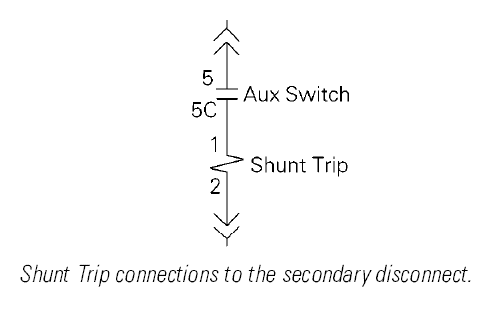 Shunt trip and shunt close are the same coil, action is determined by the location of the coil. The shunt close accessory has an anti-pump feature that prevents the breaker from repeatedly closing if the closing signal is maintained. The undervoltage trip opens the circuit breaker when its supply voltage drops below the threshold voltage. Undervoltage trip coils require continuous power supply to keep the circuit breaker closed. 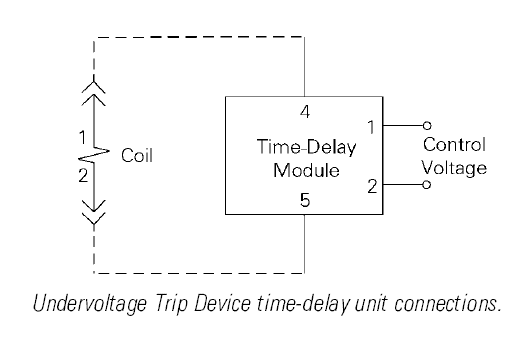 The time-delay module for the undervoltage trip can be used to set an adjustable time delay before the undervoltage trip opens the circuit breaker in order to prevent nuisance tripping from a momentary voltage drop. The time-delay mechanism is connected in series with the undervoltage trip (MN) and is installed outside of the circuit breaker. The electric lockout accessory uses a coil similar to an Undervoltage Trip Device to keep the breaker from closing unless the coil is energized. The breaker thus cannot be closed unless control voltage is applied; however, loss of control voltage will not trip the breaker. For example, two breakers can be interlocked so that they cannot both be closed at the same time. The Electric Lockout coils on the two breakers to be interlocked can be wired in series with a normally closed Auxiliary Switch contact on the other breaker to provide the interlocking function. Mechanical bypass is used to permit cold startup when control power is not available. The electrical closing push button closes the circuit breaker electrically via the shunt close. Requires installation of shunt close. The operations counter registers the total number of operating cycles for the circuit breaker. The circuit breaker communications module provides communication between circuit breaker trip unit and the communication network. Dedicated switches can be used to read status of circuit breaker. Actuators can be used to control the circuit breaker. The Open-Fuse lockout is supplied on integrally fused breakers or when the breaker is used in combination with a Fuse Rollout Element. When any fuse blows, the Open-Fuse Lockout trips the breaker to prevent single-phasing. An indicator shows which fuse has blown. The breaker is mechanically trip-free and cannot be reclosed until the blown fuse is replaced and Open-Fuse Lockout is reset. The Hidden Close Button is an unmarked replacement for the normal CLOSE button. Pressing the Hidden Close Button in the normal manner will not close the breaker; a rod inserted with light pressure is used to engage the hidden-close button.